I am an admirer of both Sir John Soane and the American artist Norman Rockwell. So on Sunday we took a drive around the South Circular to see the Rockwell exhibition at the Dulwich Picture Gallery, one of Soane’s surviving commissions. We took a pit stop at Putney Bridge to admire St Mary’s church. It has a very pretty crenellated tower which looks lovely at night when lit, but one always finds oneself in fearsome traffic and unable to make an impromtu visit. 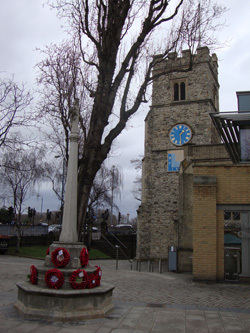 Hoorah, the clock was working accurately and on the south side of the tower is accompanied by a matching sun-dial. The church itself was unfortunately locked up, something for another time. 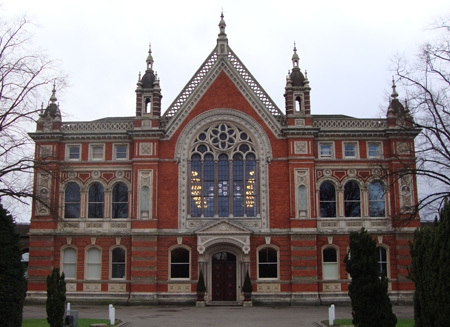 We couldn’t visit Dulwich without taking a quick look at Dulwich College, founded in 1609 by Edward Alleyn as the College of God’s Gift. The main building from around 1870 is an ornate Victorian affair in a hybrid neo-Classical and Gothic style by the architect Charles Barry Jr. It reminds me a bit of the Natural History Museum. What I love about Dulwich Village is that although it is in the midst of South London suburbia, it is nonetheless rather secluded situated as it is in copious parkland. Hence it is one of the few places where one can get a sense of what London must have been like before about 1850, when it was topographically a tight urban metropolis surrounded by satellite villages. The Dulwich Picture Gallery is as I remembered it except in much better order, both inside and out. Pristine. The collection too is in fabulous order, many pictures having benefitted from restoration in recent years. Clearly much work has gone into making the place perfect for its bicentenary this year, celebrating the endowment in 1811 which led to its becoming Britain’s first public art gallery. Part of marking the year involves a monthly exhibit of a noteworthy painting, on loan. January features the Thomas Lawrence portrait of Sir John Soane. Normally residing the rather gloomy Soane Museum library, here the picture looks magnificent, a kindly looking man in front of that signature dark red ground that Lawrence loved to employ to fabulous effect. Norman Rockwell has no connection to London that I know of. No matter, the decision to mount an exhibition featuring his work is an inspired one and all credit to Dulwich for staging a show that one might expect to see at one of the big city galleries. From the 1920s to the 1960s, Rockwell spent the greater part of his career creating cover artwork for the popular American magazine Saturday Evening Post. Several hundred of these original covers are displayed on the left side of the exhibition. Facing them are the original canvases of a selected few dozen of them. Rockwell’s skills as a draughtsman, illustrator and oil painter are supreme and plain to see. But he is criticised – rather too easily – for the folksy, over-sentimentalised quality of his pictures. I can’t help feeling this is resentment at his success in manipulating an emotional reaction from the viewer. Many of his images are deeply moving idealised visions of blue-collar America, how Americans would like to see themselves. We, as Europeans with vestiges of class still in place and perhaps seeing ourselves as being more sophisticated, can find this hard to take, hard to stomach even. But if you really look at some of these images with both open heart and mind, you realise Rockwell’s mastery at extracting every last drop of pathos or humour from them. In particular the funny ones. Any cartoonist will tell you how difficult it is to make a picture funny, even with a caption: Rockwell succeeds at making brilliantly funny images with no verbal assistance whatsoever. The above picture is unquestionably rather smaltzy. However, it clearly demonstrates Rockwell’s utter mastery of the brush, composition and use of light. This picture is a preparatory oil sketch for an illustration which was never completed. The story goes that Rockwell, with some trepidation, asked some well-to-do neighbours whether they would mind modelling for him as charladies, but they were delighted to help him. 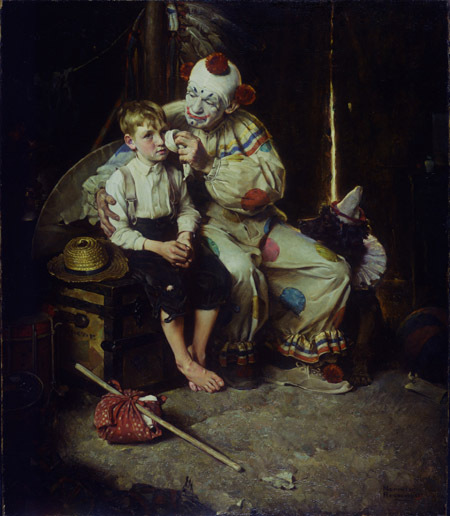 Some of Rockwell’s commissions were for portrait work. A clear expert in characature, in portraiture he seems less assured, with one or two exceptions: his image of Nehru is excellent. 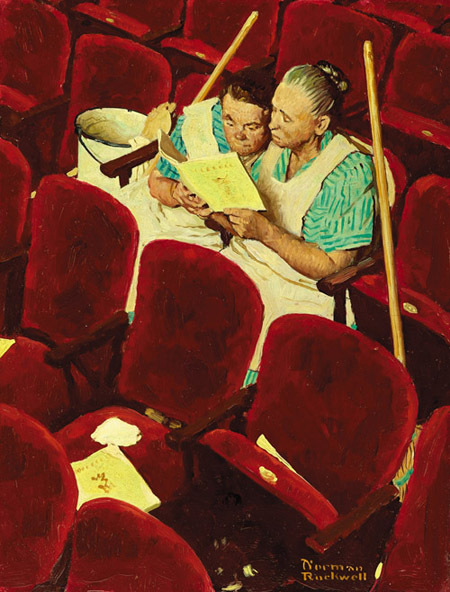 Norman Rockwell’s America runs until 27 March. Went to St Mary’s, very nice place. Did you check if the sun dail was working? Thanks for the rest great. Not much sun around, unfortunately. Thanks for drawing attention to the Rockwell exhibition – one of us quite likes his work! We also like the Dulwich Picture Gallery so you might have provided us with an outing! Whoever said “De gustibus non est disputandum” was right. Take any artist and there will be fans and detractors. Personally, I prefer works like Rockwell’s where you can see what is going on in the picture. Abstract art that looks like vomit sprayed onto the canvas just doesn’t do it for me. Maybe I’m old fashioned but I like “proper art”, not pretentious nonsense. I visited St Pancras Old Church yesterday (see blog) and there serendipitously discovered the Soane family mausoleum which the architect of the Bank of England designed for himself.